If you have a garden in New England, you probably have Evening Primrose (Oneothera biennsis) volunteering itself as a weed! Since this plant loves recently disturbed soils, gardens are one of their primary habitats, although Evening Primrose is a plant I would say I "cultivate" only in the very loosest sense of the word! The seeds of this plant are often in the seed bed of many soils, and every year Evening Primrose invariably shows-up in my garden. I always let a few stay and go to seed every year, ensuring that I'll have plenty of plants to harvest the following year. To better understand this cycle, it's important to understand that Evening Primrose is a biennial, meaning it has a 2 year life cycle. Its first year it only presents as a simple basal rosette of lanceolate, 2-8 inch long, leaves, and it doesn't flower or set seed. In its second year of growth, it sends up a thick, branching stalk and bears small, yellow 4-petalled flowers. Then, in the late summer and fall, it goes to seed and eventually dies, re-seeding itself for the following year- this is the basic life-cycle of biennial plants. For more specifics on I.D. if you don't know this plant, check out this description. Although the entire plant in flower (and its seeds as well) are a wonderful medicine in their own right, that's for a later post. (In the meantime, check-out any of Kiva Rose's writings on Evening Primrose for more on that). But it's the roots we're talking about today! The root is sweet, moistening (mucilagenous), and slightly spicy. For best results it should be harvested from first-year plants in the fall, or in its second year in the very early spring while it is still dormant. It may be cooked and eaten as a nutrient-rich wild food or utilized medicinally....or both! Evening Primrose is a great example of "food as medicine," since you're reaping the medicinal benefits, as well as the nutritional, when you incorporate it into your diet. The roots are classified as anti-spasmodic, vulnerary (heals irritated tissue), and anti-inflammatory. They have a special affinity for the respiratory system (think dry, spasming coughs), digestive system (especially for pain, cramps, inflammation, nervous digestion, and leaky gut) and also for general nervous system support. They are tonic herb in the truest definition of the word in that they work gently on the body, have no negative side-effects, and are safe for daily use. To make: This is a very simple recipe! Wash and roughly chop your roots. Put them in a glass jar and cover with raw apple cider vinegar. Add some Rosemary to taste (at least a tsp/cup of apple cider vinegar) and a few cloves of garlic, and even a dash of raw honey if pure vinegar is too sour a taste for you. Let sit for at least 2 weeks, or longer. To use: Eat the roots (and the garlic!) as is, use them as a condiment, add to stir-fries, greens- you name it! 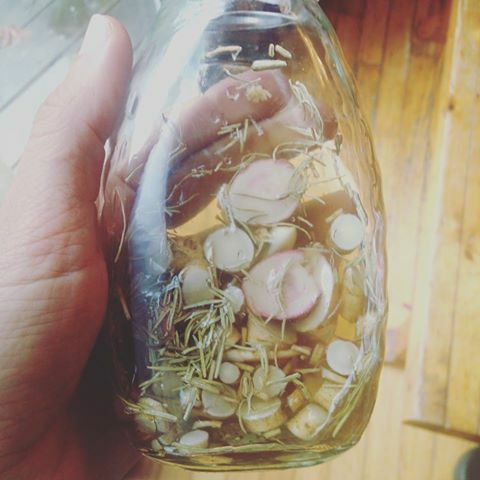 And of course you've made an infused vinegar you can use as well! Use the vinegar to make salad dressings, cook with greens and veggies, marinate meats, and so on. Since it is made with raw apple cider vinegar, it is important to realize though that you will lose the probiotic benefit if you heat it, so best to add when you're done cooking. Be Creative: This same recipe will also work for raw burdock root, carrots, ginger, beets, radishes, and more! And be sure to mix it up and use your own favorite spices!